The month of October and November are festive months for Indians. One of the biggest festival of is over now and heading for another one, Diwali/Deepavali. Indians allover India and Outside India were in festive mood last 10-12 days and I am not exception in this matter. After spending so many relaxing and fun-time with family and friends, it's hard for me to come back in normal routine, trying hard though. Same way, it was hard to come back to blogging too. Hope, you all spend quality time with your friends and family everyone and gorged on yummy foods during festive days. 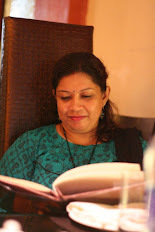 I also amde few of new dishes in my kitchen during festive time and will share with you in future. Today, I'll share a quick breakfast or evening snack recipe, I frequently make but never happened to post it in my blog. 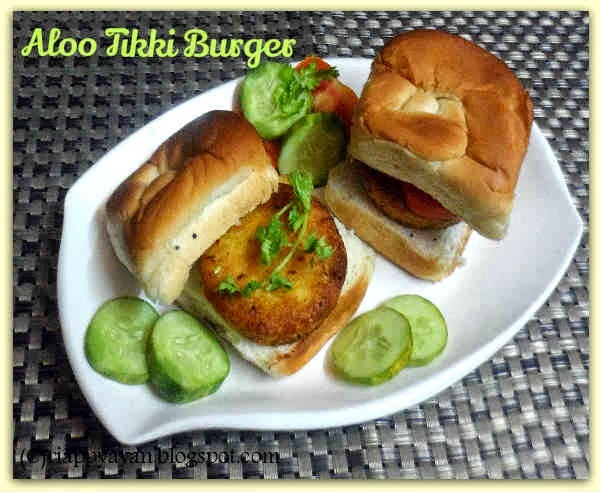 Aloo tikki Burger or potato patties made with mashed potatoes, placed inside a bun and made Aloo tikki burger. Taste great and kids love it. It's very healthy and scrumptious dish. Chat masala : 1 tsp. Red chilli powder/red chilli flakes : 1 tsp. Boil all the vegetables and potatoes, drain excess water. Mash everything finely. Then add all the spices except breadcrumbs and oil. Keep the mixture in refrigerator for 1/2 an hour. If you feel the mixture looks little soggy, add little cornflour and make a semi-dry mixture. Take out and make round shaped patties out of the potato mixture. When ready, heat a non-stick pan on a medium flame. Coat each tikki/patty with breadcrumbs and place it on pan, fry using little oil, till both sides are golden brown in colour. Drain on kitchen tissues to absorb excess oil. 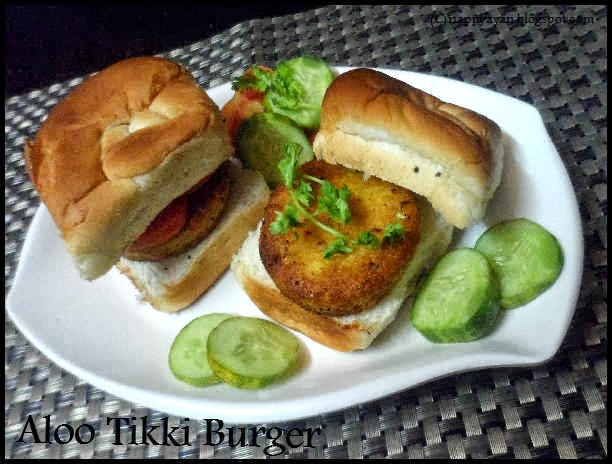 Your aloo tikki or vege patties are ready. Put butter on burger buns and slightly toast. Now place one patty on each burger bun and some cucumber and tomato slices along. Serve hot. Enjoy and Bon Apetit !!!!!!!!!!!!!!!!!!!!!!!!!!!!!! Just had dinner and looked at your aloo patty. This had made my appetite increased again. Excellent preparation. lovely clicks and wonderful brugers. luv the flavorful burger, delicious! Very healthy and wonderful burger. Lovely dish. Nice ideas of healthy burger and lunch for kids.I think kids will like to eat it.